Oliver Queen’s life is a house of cards and it’s a real shame he’s too thick in the head most of the time to realize it. This has been a common story thread throughout Arrow‘s run. Cognitive dissonance is as much a part of Olllie’s makeup as skill with a bow. This lack of self-awareness is frustrating, especially when it involves a woman who was kind enough to open her heart and/or legs for him. This week it’s Reporter/Girlfriend Susan who had Ollie dead to rights. Between his Russian gang tattoos and some photos she was able to dig up, Susan confronts Oliver about being the Green Arrow at the absolute worst time, because the cops are hot after the Arrow for the death of Felicity’s boyfriend. Supposedly Ollie has a plan to keep Susan from revealing that he’s a murderer that involves trust and the power of love or something. It’s a far cry from the way, say, Kara had a plan to put a stop to her tormentor over on Supergirl this week. Luckily for him, he has a team who has his back in the forms of Thea and Felcity. While Oliver believes that Felicity stepped over the line to protect Oliver’s identity, it really feels like Felicity’s response was equal to the gravity of the situation. Susan had enough evidence to expose Oliver’s secret during a time which such a reveal would get him thrown into a very dark hole for a very long time. Thea and Felicity really had no choice but to trash Susan’s professional reputation because a discredited Susan is not a threat, no matter how much incontrovertible evidence she might have. Oliver can’t connect the dots that a woman who sleeps with a person she is covering might not have the best decision making skills or the highest journalistic ethics. It leads to a confrontation where he accuses Thea of being ruthless like their mother, which isn’t wrong necessarily, but in this situation it kept Oliver from going to prison for murder. This little bit of palace intrigue was the most interesting piece of the episode that felt disjointed and at times underdeveloped. The Liza Warner-Cupid-Chyna White escape being used as merely the catalyst for the action in the episode. That trio banding together to “raise capital” and fill the criminal power vacuum in Star City sounds like much more fertile story ground anything they are doing with Prometheus (who was at least given lip service this episode, but still unseen this half season). They continue to fill in the edges of the other characters. New Canary got a job on the police force she’ll stop going to once it becomes inconvenient for the writers. Curtis got a new suit that makes him an even bigger target than he was before, but he and Wild Dog are becoming an adorable tandem, so you can overlook Cutis’ sartorial missteps. It was also worth noting the show’s climactic action scene was an enormous gun battle (coming the week after the series’ meditation on gun control). With the team re-formed and Susan threat seemingly neutralized, it’s time for Arrow to pick the Prometheus thread back up. This episode was the smallest step in the right direction since Oliver was having to deal with the fallout of Prometheus’ earlier evil plots. While that is nice, the longer Prometheus remains unseen, the less credible he becomes as a villain. 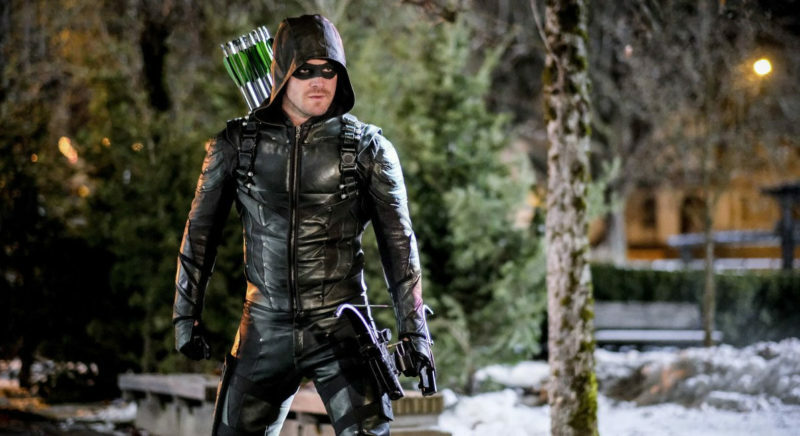 It’s time for Arrow to quit stalling and finish this story.